911 ain't no joke And you're not suppose to use it for anything but emergencies. But don't blame 5-year-old TyLon Pittman for abusing the public service. He truly believed Christmas was in danger when he dialed those three digits to stop The Grinch from stealing away the holiday. The Byram, Mississippi boy believed the Grinch was a real-life threat. So he took immediate action. And now his story of courage in the face of grinchiness has gone viral. Byram Police Officer Lauren Develle has since assured young TyLon that Christmas is safe. She says this about the incident. "Our dispatcher posted a status on Facebook that she had received a call from a little boy ... and he told her he thought the Grinch was going to be coming to steal his Christmas. I asked her to send me his address." TyLon had not told his family that he called 911 to warn his town's authorities about the possibility of a Grinch attack. They were gathered in the house Saturday night when they noticed a flashlight outside the front door. They opened the door to find Officer Develle, a petite blonde who grew up loving the Grinch movies. And she even claims that she's been compared to Cindy Lou Who on more than one occasion. She goes onto say this. "I kind of find it really funny...Every Christmas morning, my dad wears these Grinch pants. It's his favorite movie. Growing up seeing the Grinch every Christmas was my favorite thing." Tylon's brother TeDera Dwayne Graves caught the interaction between his 5-year-old sibling and the cop on video. A member of the Air Force, he arrived home for the holiday for the first time in four years. He put the video on Facebook where it soon started getting numerous likes. He said this in his post. "I can NOT make this up!!! My 5-year-old brother called the police and said that the Grinch is stealing people's Christmas and he don't want him to steal his, so they really came to our house!" Instead of scolding the young boy, Officer Develle had these words for the worried tyke. "The Grinch is not going to come steal your Christmas. I won't let that happen." TyLon had been watching Grinch videos on Facebook when he decided to take matters into his own hands and save the Holiday. He showed the officer the videos he had been watching. When Develle asked TyLon what he should do if the Grinch came back to steal Christmas, the boy bluntly stated, "I want y'all to come back to my house and take him to jail." The officer assured the young boy that her fellow officers could handle the request. The boy's mother asked if he really believed the Grinch would steal Christmas, and the boy stoically stated, "He steals everybody's Christmas." In a later statement on Facebook, TyLon said this about further apprehending the Grinch himself. "I'm going to say put your hands behind your back and get down on the ground, then when he gets on the ground, I'm gonna say, 'Why are you stealing Christmas?'" TyLon says he wants to be a cop when he grows up, and he's become quite popular with the Byram Police Department. Develle further explained that she is taking extra steps to ensure that the boy's holidays aren't ruined. She did point out, whoever, that in the original story, it's just as much about saving Christmas as it is saving the Grinch himself. The Grinch is a holiday favorite that first arrived as a TV special in 1966 and then was later turned into a live-action movie starring Jim Carrey in 2000, based on the works of Dr. Seuss. 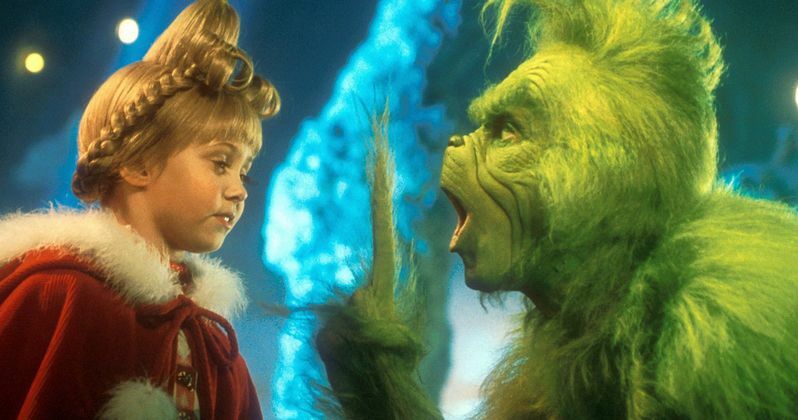 A new The Grinch movie is planned for 2018. It will be animated and stars Benedict Cumberbatch as the voice of The Grinch. This story was first reported by Clarion Ledger.